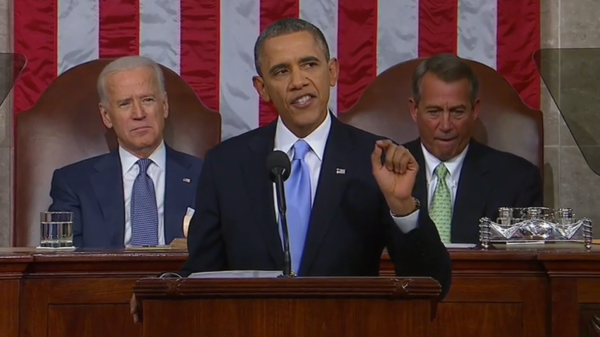 Obama took some boasts too far in his 2014 State of the Union. We found a few overstatements and cherry-picked numbers among the applause lines and proposals in President Obama’s State of the Union address. He boasted of businesses creating “more than 8 million new jobs” in the last four years. But that leaves out a loss of government jobs, not to mention the loss of jobs earlier in Obama’s presidency. Obama credited the Affordable Care Act with signing up more than 9 million Americans for private insurance or Medicaid. But Medicaid estimates include renewals, along with new enrollees. Obama boasted that the U.S. “reduced our total carbon pollution more than any other nation on Earth.” Yes, but the U.S. produces a lot of emissions. Looking at percentage change, dozens of countries did better. Federal deficits have been “cut by half,” as he said, but they’re still at historically high levels. It’s also true, as Obama said, that for the first time in 20 years, domestic oil production was greater than imports. But the increase in U.S. production is primarily due to new technology, not government policy. The president spoke to Congress and the nation on Jan. 28. Obama referred to “more than 8 million new jobs our businesses have created over the past four years.” That’s true as far as it goes, but it’s a highly selective statistic. His 8 million figure also leaves aside the nearly 4.2 million private sector jobs that were lost between the time he took office and the time the slump bottomed out. Overall, the net job gain since he took office stood at just over 3.2 million (or nearly 4 million if counting only private sector jobs), as of the most recent Bureau of Labor Statistics figures for December. The president said that “because of the Affordable Care Act … more than 9 million Americans have signed up for private health insurance or Medicaid coverage.” But that total includes Medicaid renewals, not just new recipients that gained Medicaid coverage because of the health care law. Obama: Already, because of the Affordable Care Act, more than 3 million Americans under age 26 have gained coverage under their parents’ plans. More than 9 million Americans have signed up for private health insurance or Medicaid coverage. So not everyone was a new enrollee who gained Medicaid coverage because of the law. Some of the Medicaid numbers reported by the states included those renewing their already existing coverage. Also, Obama didn’t claim that all of those signing up for coverage had been uninsured, and, in fact, we know that not all of them were. For instance, members of Congress and their staffs signed up for exchange plans, as required by the law, instead of continuing to get coverage through the program for federal employees. Update, Feb. 6: A Feb. 5 report from Avalere Health, a health care industry consulting firm, estimates that less than a third of the 6.3 million who were determined eligible for Medicaid and the Children’s Health Insurance Program represents new enrollees due to the Affordable Care Act. The firm compared the October through December Medicaid and CHIP numbers from CMS to the average monthly number of applications in July through September 2013. It then used two sets of assumptions to estimate that between 1.1 million to 1.8 million of those determined eligible for Medicaid and CHIP newly enrolled because of the health care law. Correction, Jan. 30: Our original story did not include the most up-to-date enrollment numbers. We initially said that the president’s 9 million figure included 2.1 million who chose marketplace plans, 3.9 million who were determined eligible for Medicaid and CHIP, and the 3.1 million young adults who joined their parents’ plans. But new numbers released by CMS on Jan. 24 show the 9 million figure includes only marketplace sign-ups and Medicaid and CHIP determinations. We have updated the article to reflect that information. Obama rehashed a boast first made in a major speech on climate change last summer, that “the United States has reduced our total carbon pollution more than any other nation on Earth.” As we noted then, that’s accurate in terms of the sheer tonnage of emissions reduced. But dozens of nations have reduced their carbon dioxide emissions by a larger percentage than the U.S., which is second only to China in total emissions. Obama: Taken together, our energy policy is creating jobs and leading to a cleaner, safer planet. Over the past eight years, the United States has reduced our total carbon pollution more than any other nation on Earth. But we have to act with more urgency – because a changing climate is already harming western communities struggling with drought, and coastal cities dealing with floods. According to the U.S. Energy Information Administration, the U.S. emitted 5,490.63 million metric tons of carbon dioxide in 2011. That’s 362.4 million metric tons fewer than what was emitted in the U.S. in 2003. And Obama is correct that no other country saw such a large carbon pollution reduction, by metric tons, over the last eight years. But some perspective is in order. The carbon dioxide emissions in the U.S. in 2011 were second only to China, which emitted 8,715.31 million metric tons. By that measure, dozens of countries fared better than the U.S., which reduced its emissions by 6.2 percent, including France (8.3 percent reduction), Germany (14.2 percent), Italy (15.1 percent), Spain (8 percent) and the United Kingdom (13.2 percent) — all of which committed to reducing emissions under the Kyoto Protocol that took effect in 2005 and has since been extended through 2020. The United States did not ratify the treaty. Also noteworthy, the EIA credited most of the U.S. reduction in carbon pollution to slower economic growth, weather, higher gasoline prices and an increasing shift from coal to natural gas — not necessarily the government’s energy policy, as claimed by Obama. Obama’s claim that federal deficits have been “cut by half” is true, but deficits remain at historically high levels. When Obama took office in 2009, he inherited a projected deficit of $1.2 trillion. By the time fiscal year 2009 was finished, the actual deficit turned out to be over $1.4 trillion – the highest in U.S. history. And deficits remained over $1 trillion for the next three fiscal years. The deficit for fiscal year 2013 (which ended Sept. 30) fell to $680 billion. That’s indeed less than half the 2009 figure, but it’s still higher than any full-year deficit for any previous president. The previous record was $459 billion in fiscal 2008, under President George W. Bush. The outlook for the current fiscal year is improving rapidly, but it’s still quite high. The Treasury Department just reported a deficit of $174 billion for the first three months (October through December), which is 28 percent lower than the $239 billion deficit recorded for the comparable three-month period a year earlier. That’s true. The latest figures from the nonpartisan experts at the Energy Information Administration show domestic oil production averaged 7.5 million barrels per day last year, while net imports of petroleum averaged 6.2 million barrels. And that’s the first time since 1992 that domestic production exceeded net imports. But as we’ve often noted, the remarkable boom in U.S. oil production is chiefly the result of new drilling technology — using horizontal drilling and hydraulic fracturing or “fracking” — and not of any government policy. Bureau of Labor Statistics. “Employment, Hours, and Earnings from the Current Employment Statistics survey (National); Total Private Employment, Seasonally Adjusted.” Data extracted 29 Jan 2014. Bureau of Labor Statistics. “Employment, Hours, and Earnings from the Current Employment Statistics survey (National); Total Nonfarm Employment, Seasonally Adjusted.” Data extracted 29 Jan 2014. Office of Management and Budget, Historical Budget Tables “Table 1.1—Summary of Receipts, Outlays, and Surpluses or Deficits (-): 1789–2018.” Apr 2013. U.S. Energy Information Administration. “U.S. Crude Oil Production.” Accessed 29 Jan 2014. U.S. Energy Information Administration. “U.S. Field Production of Crude Oil.” Accessed 29 Jan 2014. U.S. Energy Information Administration. “U.S. Net Imports of Crude Oil and Petroleum Products.” Accessed 29 Jan 2014. U.S. Treasury. “Final Monthly Treasury Statement of Receipts and Outlays of the United States Government For Fiscal Year 2013 Through September 30, 2013, and Other Periods.” 30 Oct 2013. U.S. Treasury. “Monthly Treasury Statement of Receipts and Outlays of the United States Government For Fiscal Year 2014 Through December 31, 2013, and Other Periods 13 Jan 2014. Tavenner, Marilyn. Nationwide Enrollment for Health Care Coverage Surged in December. Centers for Medicare & Medicaid Services. 31 Dec 2013. Department of Health and Human Services. “New health care law helps more than 3 million young adults get and keep health coverage.” press release. 19 Jun 2012. White House Website. Remarks by the President on Climate Change. 25 Jun 2013. Stevens, Madeleine, Gore, D’Angelo and Cohen, Justin. “Spinning Obama’s Climate Change Plan.” FactCheck.org. 27 Jun 2013. U.S. Energy Information Administration. International Energy Statistics. accessed 29 Jan 2014. United Nations Framework Convention on Climate Change. Kyoto Protocol. Broder, John M. “Clinton Says U.S. Is Ready to Lead on Climate.” New York Times. 27 Apr 2009.
International Energy Agency. “Global carbon-dioxide emissions increase by 1.0 Gt in 2011 to record high.” 24 May 2012.